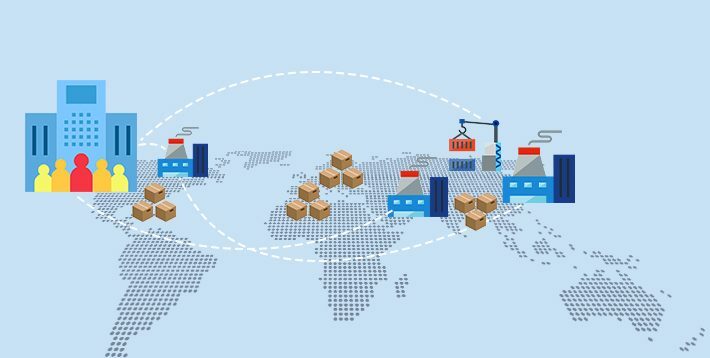 Most of the companies these days outsource the manufacturing of their products to third-party offshore vendors. Companies provide the product specifications to the vendors and Offshore Manufacturing vendors manufacture the products according to the specification. There are several reasons that the companies choose to outsource the manufacturing. Lower labor cost, lack of manufacturing expertise, lower business setup cost, demand higher than the local manufacturing capacity and unavailability of raw materials and skilled labor are few of the other common reasons. Outsourcing product manufacturing may seem like a blessing for the businesses, but this also opens a channel for the fakes to come into the market. Let’s try to understand this by an example. A company XYZ outsources its product manufacturing to an offshore vendor. The company’s brand is established and doing well in the market. Now the company places the order of 100K products and out of which 90K pass the quality check. So the company accepts 90K products, and the vendor is left with 10K products for dumping or recycling. Now a counterfeiter comes to the vendor and offers to buy those 10K products. These products may have unnoticeable defects. Counterfeiter copies the packaging of the original brand and supplies the products to the retailers at much lower cost. There is no way for the end customers to differentiate between authentic and fake, as both are manufactured by the same vendor and come in similar packaging. The counterfeiter is now reaping the benefits of the marketing efforts of the original brand, and the brand is losing out on a big chunk of its profit. 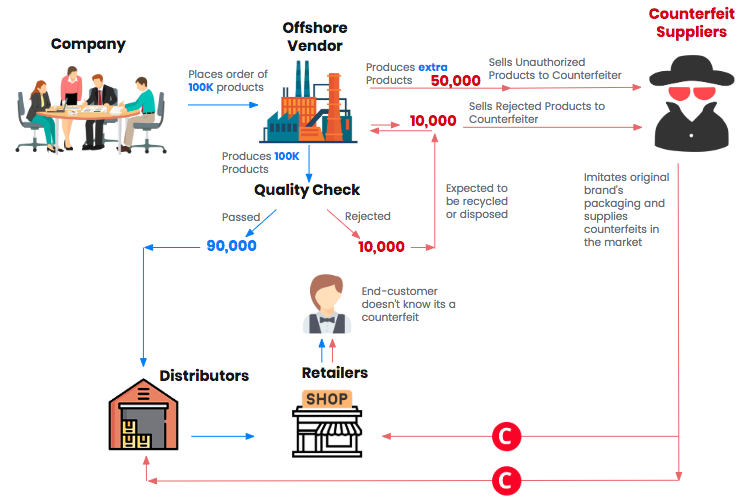 As the counterfeiter has found a profitable business model, he/she asks the vendor to manufacture additional 40K products for him (and this time they are defect free) and starts selling the counterfeits more aggressively. The counterfeiter can sell the products at a lower cost than the original brand, as there is no innovation, designing and marketing efforts involved. Retailers prefer to buy from the counterfeiter because of higher profit margins. The original brand has no way to stop the counterfeits. If the company starts using crypto tags by NeuroTags, then each of their products becomes uniquely identifiable. The AI-backed technology used by NeuroTags makes the tags impossible to copy. So the counterfeiter can no longer sell the products in the brand’s name. 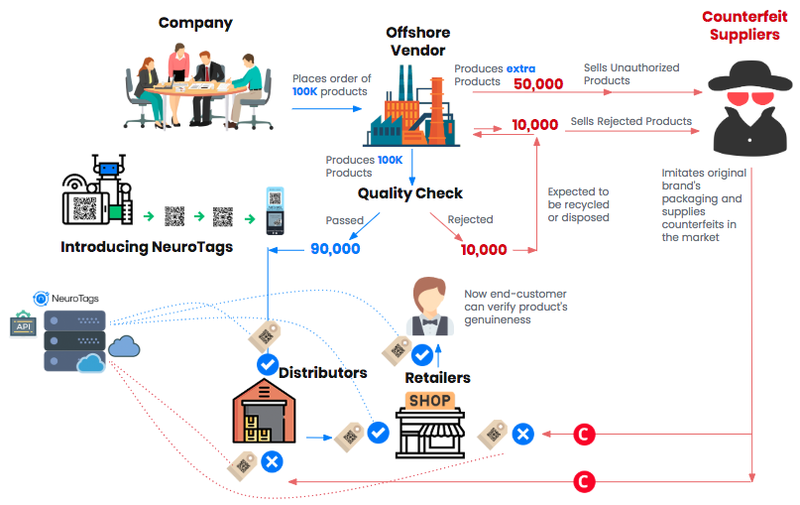 NeuroTags provides a complete end to end solution which can be integrated with the assembly line for automated marking/engraving of its code from cloud servers, so everything remains secure, and brands have complete control over the production line from the remote office. When a brand rolls out a good product, the brand earns the customers’ trust over the time. And people begin to buy the products just by seeing the brand. So even if another product is available, that is exactly the same as the popular brand. Most of the people still prefer to buy the established brand’s product.